Are you an experienced hair stylist, hairdresser, or hair salon manager? If so, it may be a good time to consider opening your own hair salon. The beauty industry is expected to grow to $11 billion by 2018 with no signs of slowing down. We’ve rallied up with the top local hair salon owners help to break down the steps to opening a hair salon business with topics ranging from beauty salon services to salon marketing plans, and of course the requirements to open a hair salon. Make sure you check out our opening a salon checklist on the right sidebar as a free download. There’s no question that this beauty industry is huge. The great thing about the hair salon is the customer retention opportunities. As a woman, you only need 1 car, but you’ll need at least 3-4 haircuts a year, and if you’re like me, 3-4 color sessions a year! And then, there’s the potential of a hair salon being acquired… not to mention the franchising opportunities! It’s a big industry, and with a lot of hard work and planning, you can grow this hair styling passion into a really great nest egg. Weak, Rigid, or Lack of Business Planning. While running a hair salon and styling hair may be a passion (which is truly great, and necessary to have) it is a business at the end of the day. With any businesses a lack of planning to set a strong foundation for sustainability and growth is critical. As your salon grows, staying rigid in old hair salon business plans is just as toxic. Changing with the growth, improving and optimizing systems will be required. Lack of Startup Funds. Some businesses start with zero cash reserves and are completely dependent on cash flow. That’s scary when there are slower days with low revenue. It’s important to have funds to start the hair salon and to operate the hair salon with as much runway as possible, but at least 6 months to ensure that your salon has a chance to sustain and grow. Lack of Marketing and Customer Research. Marketing is 50% math, and 50% research and analyzation. It is also CRITICAL for acquiring new customers (the lifeblood of any business). Without an accurate understanding of your customer demographic, you’ll likely make less-than-optimal decisions on marketing campaigns all the way down to incorrect pricing. For example: If your local demographic makes only $30k/year, you really don’t want to be charging premier prices. Scary thing is, you won’t know these things without marketing and customer research. We’re here to help you avoid those pitfalls. As the saying goes: “Knowing is half the battle.” You’re already ahead of the game by knowing the and preparing for those 3 common mistakes hair salons fail. Ready to get started? Let’s dive in to the 12 steps on how to open a hair salon! Yes, you should have a passion for hair styling or the basics of hair in general. But you’ll also need to learn about the business, the operations, and things behind the scenes. The best way to understand how a salon works is to work in one. Salon’s competitive advantages- what are they? The disadvantages – what’s not working, and why? The biggest piece no one ever talks about is training your employees. That’s something that I always see glossed over. Not every stylist is going to come in and be a rockstar. Some are great and some are just okay, but they all have to do things your way. But you need to figure out what your way is before you can anyone else learn it. And the best way to do that is to go study the business from the inside. First, let’s talk about what a business plan actually is… The best analogy to describe a business plan is to create a blueprint for your entire business, as an architect would create for a new building being designed and built. Your Hair Salon Summary. This is a short 1-2 page overview of your hair salon that may touch on the unique aspects of your business that will be defined in greater detail later. It’s important to keep this SUPER concise yet compelling. It’s the very first thing an investor or lender sees. The Products and Services that you’ll offer. Define how you will make money. All the services, the products, and prices that you’ll be charging. Include the vendors and suppliers that you’ll be using as well. Target Location and Market. Where are you planning to open your hair salon? How much competition is there? What does your target customer look like, and how much does she make? Define your customer avatar, then your customer demographics as a whole. This is where a ton of research will have to be done… Really spend the time (and sometimes the money) getting accurate research that is cross-checked with multiple sources. The Marketing Plan. Investors and lenders know that marketing is like oxygen to businesses, and with hair salons, it’s no different! This is where a little creativity can go a long way. Stand out from the noise and come up with a campaign, the design, the goal, the timeline, every single cost of running the campaign, and the ROI (return on investment) you hope to be at. Milestones and KPI’s. How will your salon launch? What measures will you put in place to ensure that you will be profitable? What KPI’s (Key Performance Indicators) will you look at to break down the revenue details? Management Team. Who is on your team, and what makes them great? How many years of experience do they have and what specializations do they hold? Investors want to know about the people who will be making their investment worthwhile. Really sell your team’s abilities here, provide links and photos to examples of their work (in the appendix), and any awards and recognition will be a great plus. Your Salon’s Financial Plan. How much money are you looking to raise? How will you spend the money and how fast? What is it going to cost to run your business? What does your revenue need to be to break even, and what does it need to be to profit? This piece is critical, and may require the help of an accountant and some accounting software to be accurate and complete. Appendix of materials. All photos, links and outside research should be included in the last section of your business plan. Neatly organized so that it will be easy to find in the eyes of the investors and lenders. Writing a business plan is not easy, and we’re here to help. If you’re truly interested in this step, and the completeness of your hair salon business plan, we’ve got a solution that will make it much easier for you. You’ll want to make sure your logo is created for use in the beauty salon business plan. We highly recommend 99designs. You set your price and the designers compete for your budget as their prize. What’s really cool about 99 Designs is how you can go through a few rounds of revisions with your favorite designers, and give them feedback so that you get exactly what you want. They also have a logo store where you can shop for logos (just replace text with your business name) for as little as $99. How efficient! A question we get all the time is, “How Much Money Do Hair Salon Owners Make?” The truth is that some salon owners will make way more than others due to factors of location and demographics of course. But the earning potential for a hair salon owner is definitely there. Salon owners make between $46,000 and $70,000 yearly, not including any earnings from actually styling hair for clients. To figure out how much you can make, decide how much each service costs. Then figure out how you can make more off each visit. That should give you an idea of how much your salon can bring in. 3) Complimentary add-on services – On birthdays and special occasions you may want to give them a complimentary hair treatment or blow out. Offer things that are fast, and relatively inexpensive– they make a big difference with the customer regardless. 5) Loyalty programs – This is a bit of a slippery slope when done incorrectly. You may lose money on a loyalty program more than the benefits. Make sure that you’re calculating the costs accurately before offering loyalty programs. 6) Referral programs – Referrals are the best form of organic customer acquisition. You provide excellent styling services, you get back new customers! It’s nice to send the person who referred a new customer with a thank you note, and possibly a complimentary add-on service like a deep condition next time they are in your salon. Again, give something that isn’t going to make you lose money. 7) Get clients to book their next appointment before they leave – that ensures they come back. Very powerful technique! 8) Focus on customer service – if customers feel loved and welcome, they won’t look for any other place to get their hair done! So how much does it cost to open a hair salon? It varies depending on the type of salon you want open and the services you will offer. Make sure to create a hair salon financial plan to give yourself a good foundation. Read on for more details. If you’re running a business out of your home to get started, you can make that happen for around $2,000. You just need to invest in quality equipment and supplies and spend a little on business cards. If you’re starting a franchise salon, that can run anywhere from $75,000–$290,000. There are pros and cons to that. You’re going to pay a lot of money for it, but that will instantly make people trust your store, plus you’ll show up first in Google. Opening your own hair Salon? That can cost anywhere from $40,000 to upwards of $200,000 if you’re going super swanky. It’s also important to consider how you will budget your operations, your revenue goals, and where your deficits are coming from. Note: For your projection sheet, you should break down your sales by the service type as well, so you can get a good sense of which services are driving the MOST of your revenue. That way, you can invest more capital into those high-revenue services. After that, it’s time to start filling in the blanks. In this example below, I assumed the cost of goods, and some general numbers in the expenses. Now, it’s time to start putting in some projections. In the very beginning of your startup, this will serve as a goal sheet. It’s important to track these things monthly in the actuals and compare it against the goals so you know where you’re falling short. Assuming that this business opens in January, I kept revenue numbers pretty conservative. Q1 is when I have this hair salon opening, so there is a deficit in the first month (appears in red in the spreadsheet above). Assume that as your business grows in revenue, it will naturally grow in expenses: more employees needed, more supplies and products, etc. If your services and products have additional categories like hair spray, shampoo, haircut, color, perm, I would consider adding them to the revenue rows so you can see where the sales are growing most and falling short. If you start to see deficits in your profit, this cash flow worksheet will give you a sense of where you’re not meeting the goals, and what area of the business you’re falling short. The products and services you offer at your salon help set your image. If you can do something better than anyone else, customers will come to you…Especially for their hair. There are more specialized salon where they only do blow outs, no cut, no color, only shampoo, blow out and styling. On the flip side, have you ever gone back to someone who messed up your color? Or who took off too much in a hair cut? No, of course not. So don’t offer anything you can’t back up! Upselling complementary products and services is a great way to boost your salon’s revenue. Ths is so important because it can get your salon to the break-even point much faster. Once you’ve been in business for a while you can see what sells best and what doesn’t sell at all and get rid of products and services no one uses. Just remember to ask yourself, why should a client come to my salon instead of someone else’s? Figure out what you do best and focus on it! You should check out these 10 Hairstyles to Feature at Your Hair Salon! This is where the whole budget idea helps. And so does understanding your salon’s earning potential. A great location does a few things. It gives you a space to have your business, but it’s also a tool to bring in more business. You want a blend of balance and premium realty. Foot traffic is important unless you only take appointments. You want a well lit, inviting place for ladies to feel welcome and comfortable. Try and find a good balance of rent costs and earnings potential, in an area you actually like. You want employees excited to come to work, and being in a hip, cool area is great for that. But even better than being in a hip, cool area is being in a place which generates lots of profit. So choose wisely, and plan ahead! Select a location based on smart thinking, not just on an emotional reaction to loving a building or view. Opening a salon is hard work, so make it a little easier by picking a great location. Once you’ve got your location picked out, your budget set and your products and services picked out, you need to find suppliers. You can do this online or at trade shows or look for distributors. But compare cost and quality, don’t just go with the first option you see. So what equipment do you need to open a hair salon? Additionally, you’ll need standard office supplies and a first aid kit. You may also want to keep a mini fridge stocked with still and sparkling waters. They’re not expensive and the clients appreciate it the mild luxury of a cool bottle of water. Figure out the supplies you need and the best place to get them to make sure your business is ready for success. You can have the best salon in the world, but if you don’t have any clients your business will fail. Here we describe ways to create your own hair salon marketing plan. Promoting your hair salon is absolutely necessary for sustaining your business. Even as an established salon, you still need to be constantly adding new customers to your client base. There are tons of ways to do this, but focusing on local marketing is the most effective technique for a business relying on a physical service. It doesn’t do any good to promote your salon to New York residents if your salon is in Chicago. Local Contest Giveaways – don’t be afraid to give something away to get a new client into the store. Email Marketing for Existing Customers – let your clients know about specials or discounts you’re offering to bring them back in! Phone Book Listings – some people do still use phone books. Referrals – easily the strongest marketing tool you can have! A satisfied customer recommending you to more people is the highest compliment your salon can get! Hiring the wrong person, or even having the right person in the wrong position can really hurt your business. You have to be able to trust your people to run the salon even if (especially if) you can’t be there. You need to know not only how many people you need on staff, but what type of people and where to find them. You can protect yourself by having a potential hire demonstrate their abilities and also by interviewing with questions that will verify cultural fit. In addition, you must also put together your stylist training program. All of your stylists should know the amount of time they have per service, and how much product to use per shampoo/conditioning. Employees don’t ever notice wastage until you show them how to care about it. It’s not their money they’re wasting, it’s YOURS. Protect your investment, and make sure you have a policy/standard operating procedure for everything. This is the fun, but highly expensive part. Deciding on a style for your salon can be a challenge. You want to represent your personality, but not scare away any clients who may not share your passion for neon everything. Instead of guessing what your potential local clients want to see, ASK! You can do some surveys in local malls, or restaurants, ask them what’s missing. You can do surveys online and on facebook with easy local targeting. As for a logo, you might want to check out 99designs. Pay a price and let designers compete for the prize with their designs you get to pick from. The salon, no matter what the style needs to be relaxing, exciting, hyper-organized, and most importantly CLEAN. Women go to the salon to be pampered. Provide them with beautiful space, comfy seating, and lots of beautiful natural light to admire your hard styling work. This California salon is a small space, but you can hardly tell because of how beautifully they maximized their sq. footage. This salon looks like a modern spaceship. We love how clean and modern it looks without sacrificing style and comfort. This hair salon’s bold chevron floor could EASILY have overpowered the space, but paired with the clean decor and general hollywood glam, it works incredibly well. This salon is ooooozing with style, which is always a great achievement in designing your space. Your hair salon’s logo needs encompass what you’re hoping to display visually. 99designs.com is very cool because you set a budget, and people bid on your logo by sending you sample logos. The winning design gets paid the budget you set! It’s awesome because you have several designs from all over the world competing to win your prize. One note about 99designs: make sure you give LOTS of feedback and backstory about the style you’re envisioning. Provide actual samples to logos you like so the likelihood of someone nailing it on the head goes up tenfold! Like what you see? We’ll send you the templates so all you have to do is replace the details. Click below to download the Adobe Illustrator files now! You’ll also be able to make sure nothing is missing from your inventory by using a good accounting system. Getting involved in the salon owners’ community is a great idea! Not only do you get valuable trade techniques and opportunities, but you can chat with likeminded salon owners who are dealing with similar struggles. You get to go to (and participate in) fashion and trade shows. You meet amazing women and make lifelong friends. And you never know where your big break might come from! You can talk to other people in your industry and other business owners, in general, to get business tips, advice and hacks for faster growth. Also, don’t hesitate to get involved online through Facebook. Follow groups on Facebook with other salon owners to get ideas on new products and services to offer, and more efficient ways to run your business! Bottom line: Opening (and running) a salon is a lot of work. But if you do it right, it’s not only rewarding, it’s a lot of fun. I love being my own boss and I love having a business which brightens people’s lives. Hopefully, this article will give you a sense of what it takes to open a hair salon. Are you ready to take the next step? We’ve put together a comprehensive report on how to start your own hair salon. 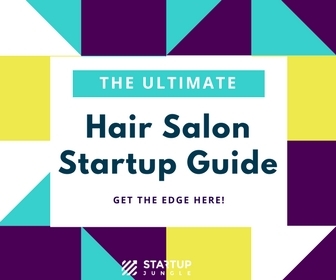 All the licenses you need and where to get them, all the supplies, goods, and products not to forget…simply click here to get this complete Hair Salon Startup guide today to give yourself the edge against the competition! Best of luck to you and your new hair salon business! great info. thanks for the templates for the business cards guys!